The new Honda Civic is so boring you'd probably have to pay me to write something positive about it, which is exactly what Honda attempted to do via a third-party European company. Welcome back to the world of pay-for-post blogging where automakers desperately try to generate positive social media buzz — and fail. I first received an email from Russell Thomas in January saying there was "a major car brand" that was willing to fork over cash to Jalopnik to write about their car. While my journalistic pride means I have no intention of actually accepting a check in a money-for-coverage scheme, my journalistic curiosity led me to write him back and and let him know I was interested. I was informed by Thomas that all I'd have to do is sign up as a "publisher" on the website of eBuzzing, the company he works for, in order to access campaigns. I did, and, after filling out their form telling them my primary language and general traffic stats, I was "validated" and assigned my first story. Sadly, the first story was not the one originally promised, but a chance to earn £200.00 (approximately $315) to write about Red Bull's experience in the Dakar 2012 Rally. Since I wasn't interested in Red Bull I passed, although we did end up writing a few articles on the event — they were mostly centered around Robby Gordon, who is sponsored by a different energy drink company. Are The French Discriminating Against NASCAR Driver Robby Gordon? If we never venture into the unknown how do we get anywhere new? When Honda engineers set about designing the new Civic, they ventured into the unknown. They pushed boundaries. They took every path along the way. And in doing so, they created something amazing. Exploring is part of the fun. That's why we took a 360º camera off the beaten path. Go on, take a leap. Use your cursor to explore the environments and click on the arrow to venture forward. You'll find things you can't imagine. Please let me know when you've published by sending me the URL. This time around, it's payment by invoice, so please send me an invoice for the £50 as soon as you have a chance and we'll pay it on our next pay-day (these are the 2nd and 4th Thursday of every month). Now that I knew what the video was I'd be able to see if anyone had taken up Honda on their offer. A search revealed a few smaller websites already posted this video and similar videos from Honda using the same eBuzzing player. Some sites, like Tech Patio, did mention this was a "Sponsored Post" in small text at the bottom of their entry. This is technically a requirement of their Code of Conduct, which is something Russell failed to mention to me in our conversations. Perhaps this explains why sites like Parent Wheels neglected to mention it. Ironically, that site bills itself as putting forth "Real Opinions" for family motorists. Honda, sadly, isn't the only one trying to accomplish some social media "buzz" with a little post-ola. Both Jeep and Peugeot are listed with campaigns, though entirely for Europe, which makes sense since eBuzzing is a European company. Formerly the "Wikio Group," eBuzzing's portfolio comes from a mixture of European web properties including portal Overblog. According to a TechCrunch post from August, the company made $15 million in 2010 with a staff of just over 160 across Europe. They also took on $25 million to change their name from the Wikio Group to eBuzzing last year. They have numerous ad campaigns running at this moment from major brands like Microsoft, Addidas, Lacoste, Chico, Sprite and many others. Some pay by the view (around $0.05 to $0.13 per) or by the post (as much as $104 for an Air France video). Honda appears to be an active client with multiple campaigns running in three different countries based around these same promotional videos. The interest eBuzzing has in Jalopnik might be because of our very large European audience, as they don't list America as a target for their advertising. In America, you don't have to directly pay for content anyways, as Chrysler so inexpertly demonstrated last week. Numerous contests allow automakers to skirt paying bloggers directly by offering them trips and goodies, either for themselves or their readers. 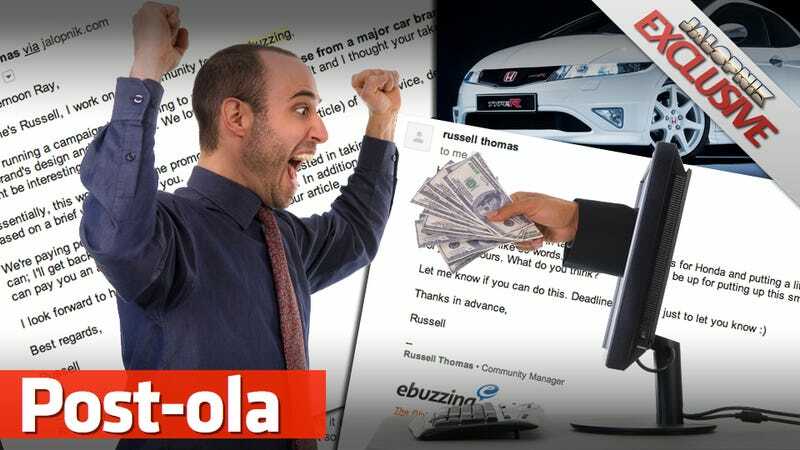 A direct payment from car companies seemed unlikely, even to my jaded expectations, until I got the email from Russell. If there's any consolation in this post-ola scheme is that Ebuzzing doesn't seem particularly good at this trust-gaming exercise with regards to English audiences (the French might be an exception). Most of the sites I tracked using this specific campaign were relatively small and around half appeared to mention somewhere that it was a sponsored post. That Honda would want to pay people to talk about the Civic wasn't surprising given the almost universal critical loathing for the American version, but the European version doesn't have the same problems. A spokesperson for American Honda said they don't work with eBuzzing but can't speak for their European arm. I can only speak for American Honda. We do not do any business with eBuzzing nor do we pay for coverage in the U.S. Our European operations are separate from our U.S. operations including promotion for the Civic—-which, as you know, is a completely different car than is sold in Europe. Technically, if I pasted the video from Honda in this post I'd still be able to invoice the $78 since Ebuzzing states that they value authenticity and honesty. "Be yourself! Your style, your tone, your words and your editorial angle are the basis of your identity and success within your community. No ad campaign justifies betraying who you are."